What’s interesting [now] is that there is an emergent new model, and you all are here because you are part of that new model. I don’t think people have really understood how big this opportunity really is. It starts with the premise that the data services and architecture should be on servers. We call it cloud computing – they should be in a “cloud” somewhere. And that if you have the right kind of browser or the right kind of access, it doesn’t matter whether you have a PC or a Mac or a mobile phone or a BlackBerry or what have you – or new devices still to be developed – you can get access to the cloud. There are a number of companies that have benefited from that. Obviously, Google, Yahoo!, eBay, Amazon come to mind. The computation and the data and so forth are in the servers. My interpretation of cloud computing is summarized in the following figure. Yesterday, I introduced the concept of Synced-Data Applications (SDAs). SDAs are summarized in the following figure. 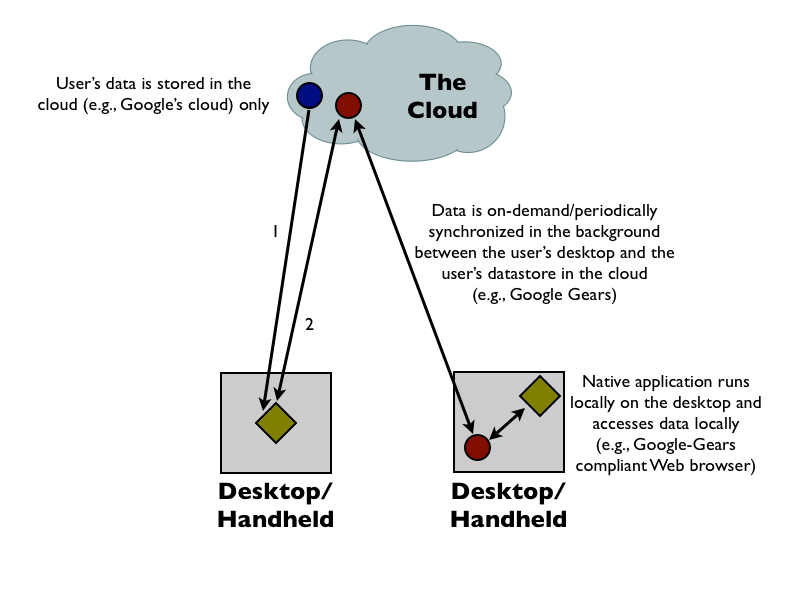 SDAs owe their existence to the convergence of the cloud and the desktop/handheld. When was the last time you were impressed by desktop software? After seeing (in chronological order) Steve Jobs, Al Gore and Tim Bray make use of Apple Keynote, I absolutely had to give it a try. And impressed I was – and to some extent, still am. For me, this revelation happened about a year ago. I cannot recall the previous instance – i.e., the time I was truly impressed by desktop software. Although I may be premature, I can’t help but ask: Is desktop software dead? Wikipedia states: “There is no page titled “desktop software”.” What?! I suppose you could argue I’m hedging my bets by choosing an obscure phrase (not! ), but seriously, it is remarkable that there is no Wikipedia entry for “desktop software”! Microsoft, easily the leading purveyor of desktop software, is apparently in trouble. Although Gartner’s recent observations target Microsoft Windows Vista, this indirectly spells trouble for all Windows applications as they rely heavily on the platform provided by Vista. There’s an innovation’s hiatus. And that’s diplomatically generous! Who really cares about the feature/functionality improvements in, e.g., Microsoft Office? When was the last time a whole new desktop software category appeared? Even in the Apple Keynote example I shared above, I was impressed by Apple’s spin on presentation software. Although Keynote required me to unlearn habits developed through years of use Microsoft PowerPoint, I was under no delusions of having entered some new genre of desktop software. Thin is in! The bloatware that is modern desktop software is crumbling under its own weight. It must be nothing short of embarrassing to see this proven on a daily basis by the likes of Google Docs. Hardware vendors must be crying in their beers as well, as for years consumers have been forced to upgrade their desktops to accommodate the latest revs of their favorite desktop OS and apps. And of course, this became a negatively reinforcing cycle, as the hardware upgrades masked the inefficiencies inherent in the bloated desktop software. Thin is in! And thin, these days, doesn’t necessarily translate to a penalty in performance. The figure below attempts to graphically represent some of the data points I’ve ranted about above. An opportunity for networked, Open Source software. AFAIK, that upper-right quadrant is completely open. I haven’t done an exhaustive search, so any input would be appreciated. A new battle ground. Going forward, the battle will be less about commercial versus Open Source software. The battle will be more about desktop versus networked software. 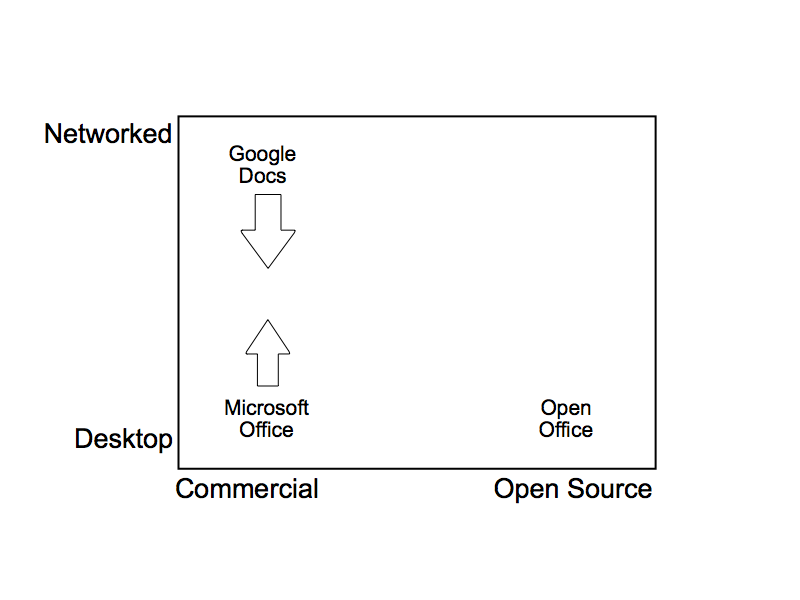 So: Is desktop software dead? Feel free to chime in! To Do for Microsoft: Create a Wikipedia entry for “desktop software”. 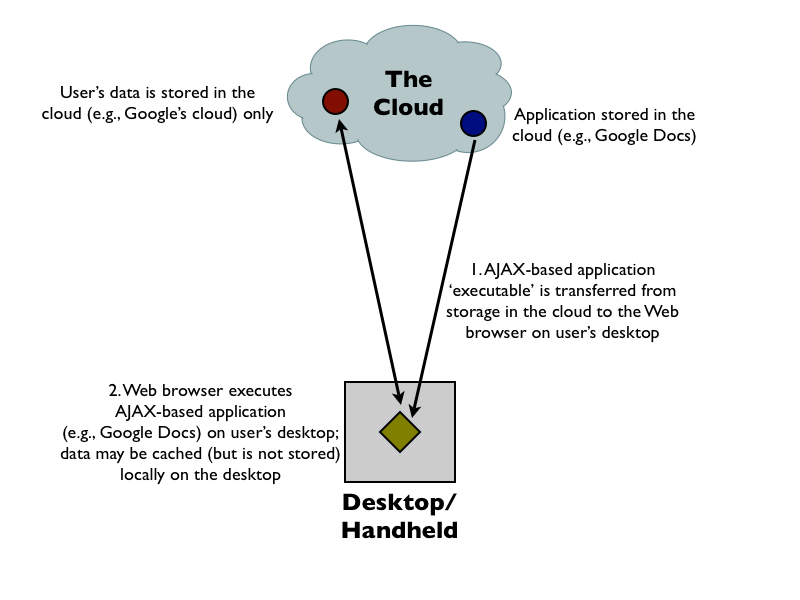 Google Apps for Your Domain: The Browser-Based Version of the Network Computer? A network computer is a lightweight computer system that operates exclusively via a network connection. As such, it does not have secondary storage such as a hard disk drive – it boots off the network, but runs applications locally, using its own CPU and RAM. This set NCs as distinct from terminals, which act as a client for an application server. During the mid to late 1990s, some commentators and industry players such as Larry Ellison of Oracle Corporation, predicted that the network computer would soon take over from desktop PCs, and that many users would use applications loaded via a network instead of having to own a local copy. So far, this has not happened, and it seems that the network computer “buzz” was either a fad or not ready to happen. The NC can be considered to be another computing paradigm. Just as PCs did not replace mainframes, so NC will not replace PCs. The new technology provides a more appropriate alternative in certain areas and can co-exist with established systems through open standards. … a set of hosted applications for organizations that want to provide high quality communications tools to their users without the hassle of installing and maintaining software or hardware. Given that GAFYD is a browser-based version of the network computer, one wonders if history is destined to repeat itself.